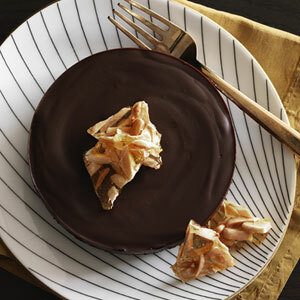 Try this easy, chilled chocolate tart for a sweet finish to any meal! 1. Heat oven to 350°F. Butter the bottom and sides of two 4-inch-diameter round or heart-shaped springform pans. Process graham crackers and almonds in a food processor until the mixture forms fine crumbs. Add butter; pulse until incorporated. Press into bottoms of prepared pans. Bake 10 minutes, until crusts are set; let cool on a wire rack. 2. Whisk heavy cream and honey in a 2-cup glass measure until blended; microwave on high 1 to 2 minutes until mixture is simmering. Add chocolate; let stand 1 minute, then stir until mixture is smooth. Pour mixture over prepared crusts; smooth tops. Refrigerate at least 3 hours (preferably overnight). 3.Loosen tarts from sides of pans by running a knife around the edges. Remove sides of pans and transfer tarts to dessert plates. Top with pieces of Almond Crunch Brittle and serve. Enjoy! And thanks for checking out my blog! !